All Four Love: I'm Addicted to Cloth Diaper....Detergent? I'm Addicted to Cloth Diaper....Detergent? Throughout our time cloth diapering C, we have used several brands of soap and various additives to pass the post-wash sniff test. The answer has always been different, but we've been fortunate enough to figure out the stink issues as they arise. 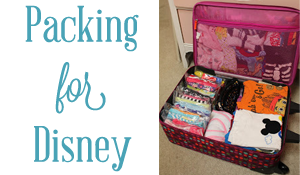 Here is our timeline of cloth diaper cleaning and what has worked for us. 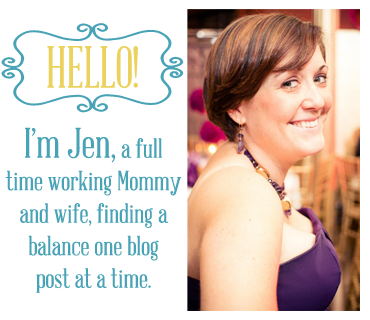 When we first started cloth diapering, C was exclusively breast fed. Looking back, I can honestly say I miss these diapers. Toddler poop is the WORST. Babies who are breast fed have water soluble poop that can go right in your washing machine. Really, I promise. Since we had bumGenius diapers at the time, we bought bumGenius Detergent. At 71 HE loads for $14 w/ free shipping comes to about $.20 a load. Doing diaper laundry every other day means the bag lasts over 2 months. Not too shabby. Its a pretty standard detergent and it did a great job on newborn/infant diapers. As time went on however, we found it not being able to keep up with what C was dishing out. We kept the remaining detergent to use on baby clothes, but needed something new for the diapers. After our Charlie Soap was gone, we tried plain, original scent, blue Tide, but that didn't work. Its not technically a cloth approved detergent, but I'd read about some people having success with it. After that, we moved onto Rockin Green - a detergent I'd heard rave reviews about. It would surely fix whatever diaper problem we were having. Rockin Green comes in three formulas to suit your every water need - Soft Rock, Classic Rock, and Hard Rock. We bought Classic Rock not realizing that hard water could be our problem. It worked really well for almost a year and at 90 HE loads for $15 ($.17 a load), it was comparable to the other detergents we'd used. Rockin Green also makes an ammonia treatment called Funk Rock that helped keep nasty pee smell at bay for quite a while. It is good for stripping diapers and the occasional cleaning boost without harmful chemicals. All around good stuff. Then the stinkies came. Ever use a clean towel to dry off only to find it smells like mildew the second water hits it? That's the result of mineral build up. The same thing happens with diapers except instead of mildew smell, its acrid urine smell. Its as awesome as it sounds. Using a water test kit from Rockin' Green, we discovered that we had hard water. Very hard water. I ended up on a microfiber stripping spree one weekend that included boiling inserts on the stove before moving onto another detergent. Hard water makes cloth diapering a little, well, harder. Its not impossible, but our simple wash routines with simple laundry soap wouldn't do anymore.When you wash cloth diapers (or anything, really) in hard water, minerals can build up on the material, trapping detergent and other stuff in the fibers. For regular clothes, this can make them look dingy or feel rough. For towels and other absorbent materials (like diapers) this can seriously decrease their absorbancy and cause stink issues. We switched to Rockin' Green Hard Rock, but found ourselves using so much of it (almost double), our $.17/load washes became $.34/load washes and that's not okay. The other issue was that the diapers still stunk! I'd read that Hard Rock, while awesome, can cause stink issues when used in really hard water. Apparently, that meant us, and after 18 months of detergent switches and a few half assed attempts to strip the diapers it was time to bring in the big guns. I ordered some RLR Laundry Treatment from Jillian's Drawers and went to work. Ya know what? It freaking worked. After months of fighting with build up on our diapers, they were back to square one. Now what? We didn't want to let the diapers get mineral build up again, but the Rockin' Green was getting expensive. In comes Calgon. How did I not stumble upon this before?! 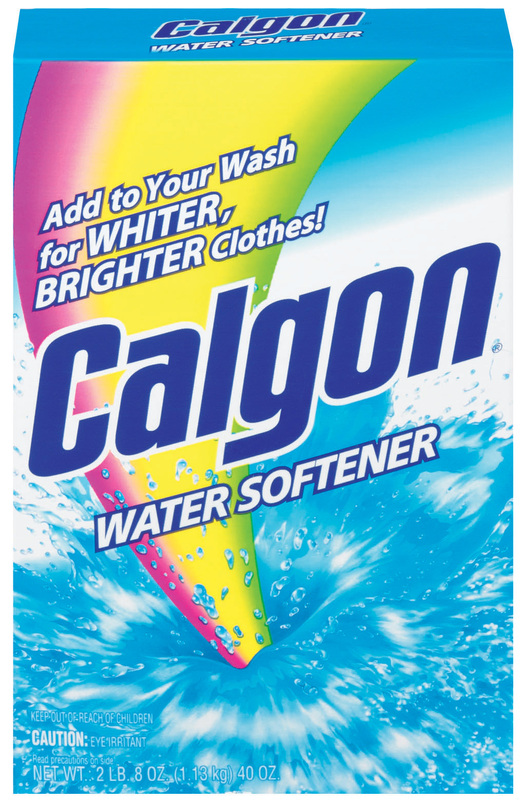 Calgon is a water softening laundry additive, found right in the laundry aisle, that you can put in with the detergent on any load of wash. It suspends minerals and other "stuff" in the water until they are rinsed away, not allowing it redeposit in the fabric. It lets the soap sud up and actually do its job. Genius! It comes in liquid or powder form and its recommended that you buy whatever matches your detergent. We use powder, so we bought powder. At $5 a box, its cheap and easy to use. Here's where the addiction comes in. Technically, the Rockin' Green + Calgon mixture is working. BUT I wanted to see what else was out there. Its not you, Rockin' Green....its me. Yesterday, I received a box of Tiny Bubbles, by Grovia, and can't wait to give it a shot. Its said to be very effective in hard water and comes to about $.21 a load. Not ideal, but if it works, I'll deal with it. 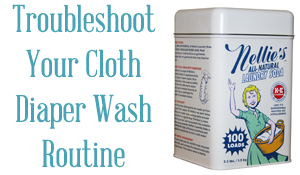 Everyone's wash routine is going to be different and the trick is to find out what works for you and your diapering situation. If we had soft or normal water, who knows - we could have stayed with Charlie's Soap. Its all about troubleshooting whatever issues pop up. Is it all as cheap as making my own laundry soap, Duggar style? Of course not, but its cheaper and safer than Tide and being able to successfully cloth diaper is a heckofalot cheaper than buying disposables. I'll surely spend $7-$9/month on detergent if it means not buying disposable diapers! UPDATE: We ended up really liking Tiny Bubbles, but it was on the more expensive side. 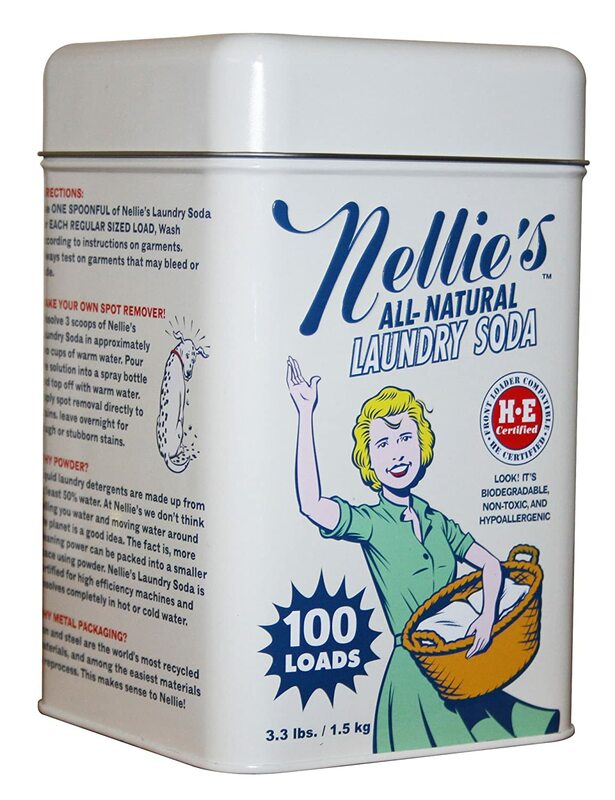 We ended up buying and loving Nellie's All Natural Laundry soda. Its simple, easy, and priced well. A 100 load tin of it is around $16 on Amazon with free shipping (the price fluxes). That makes it about $.16 a load. 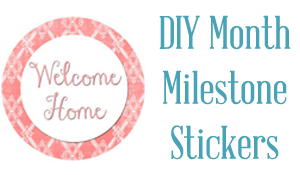 If you're doing one load of diapers every other day, this can will last you over 6 months. 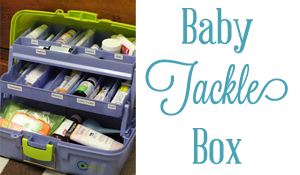 Cotton Babies, in all of their awesomeness, ships for free with no spending minimum - even heavy boxes of powder detergent! Use the minimum amount of detergent as you need to still things clean. Too much can cause build up and repelling even in normal water. Not all "earthy" detergents are made the same. Free and clear detergents have chemicals such as enzymes and brighteners that can damage cloth diapers. Here is a super helpful chart on safe detergents from The Diaper Jungle. Different stink issues have different solutions. Here is an awesome stink chart from Padded Tush Stats that breaks down the various stinks and their likely causes. Vinegar, though awesome in breaking down mineral build up in towels, can actually weaken the elastic on cloth diapers, shortening their lifespan. A cold rinse before the wash cycle will help prevent set in stains. If you have a front loading (HE) washer and need to do a serious clean, add more water. Some washers have an "add water" button, but not all do. You can also add water with a pitcher to the detergent drawer as the washer fills. Oh, this is SO useful about hard water! We have what I figure must be mineral buildup after moving to a new area with hard water -- aha! Now I know what to do about it. Love the new layout and name, BTW! Great information. I am just getting into the research phase of cloth diapering for my new LO. Several people have recommended the bumgenius cloth diapers to me to start my stash!! Now is know how to wash them! This is very helpful! I really like the way you explain things! Do you mind directing me to a source on how to use powder detergents and washing soda in a high efficiency front loader? I also have hard water, so I'm slightly worried about using cloth diapers. We're due in April 2014 and so far I've been so excited to do cloth! My google searches have been saying that there's usually mineral build-up in the laundry machine with powder. I've also read that powder detergents are better for cloth diapers. I've used liquid detergent for laundry and dishes all my life, so any help would be great. Are you still using Nellie's? If so, do you use Nellie's with the Calgon??? Yup! We are still loving Nellie's and yes, we use it with Calgon. It really does a great job. Once in a while we'll find bags of Nellie's at Marshall's or TJMaxx for like $5 a bag, which is awesome! Nellie's best price is at COSTCO.CA. I find Rock in Green to be very expensive in Canada and only available at Snugglebugz and Amazon, bumgenius detergent is doable, it is at toyrsus but still much more expensive then Nellie's. I don't have my own children yet but when they do come it will be Applecheeks/Bumgenius Cloth diapering all the way. I have seen and read and studied about Chemicals used in Pads and diapers. Yes, when I am working disposable pads are a must for that time of the month, but I don't have the heart to leave a baby in chemical disposables 24/7 for 18-24 months of their lives. A period is only a week, a baby is in disposables 24/7 that's why I am against disposable diapers. For my friends and children I babysit who are using cloth diapering already I just wanted to know on an HE TOP LOADER WASHER Is it safe to use Calgon(put it in the softner section), Nellie's laundry soda mixed with Nellie's oxygen brightener in the Laundry detergent compartment at the same time? How often should Calgon be used, here in the Western Prairies in Canada we do have very hard water and a dry climate. I love Rockin' Green! I have hard water, but I guess it's not as hard as yours is. I haven't had any issues with it. I'm so glad because I love the Smashing Watermelons smell so much! Where do you buy the powdered Calgon? I saw really mineral hard water.I like useful to me.if you have more time please check my samilar brand gym clothes canada.